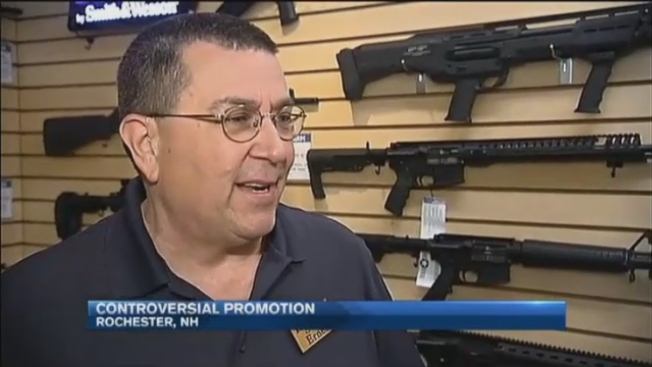 A promotion at a New Hampshire car dealership is causing controversy. It's called "Buy a car get an AR" — as in an AR-15 semi-automatic rifle. The sign outside Hagan's Motor Pool in Rochester is making people do double takes. "That's crazy," said Rochester resident John Elliott. "They're giving out guns now," asked George MacKenzie. "Are you for real?" Dealership owner Mike Hagan says to him, the promotion makes perfect sense. "This is New Hampshire," Hagan said. The combat veteran opened the dealership in 2010 when he returned from Afghanistan. He says this promotion has been his most successful yet. "We've sold 10 vehicles as a result of it," Hagan said. "Five declined taking a firearm. We've sold four with the rifle and one with the pistol." The giveaway works like this: If you purchase a vehicle with an AR-15 sticker in the window, Hagan says you're eligible for a free gun. You'd then go 10 minutes down the road to Renaissance Firearms in the city's Gonic neighborhood to pick up your choice of a 9mm Smith and Wesson or an AR-15. "I get their identification, their name, and then a background check through state police or NICS," Renaissance owner Ernie Shipman explained. When asked whether Hagan was making it any easier or quicker for someone to get ahold of a gun, Shipman responded, "Absolutely not. We are bound by ATF regulations." "If they wanted one they could go buy it themselves," Hagan said. Still, Hagan's logic isn't enough for his critics. "I think it's actually kind of rude with what's going on in Orlando and everything else in the world," Elliott said. This promotion, however, started in May. Hagan makes it clear this was not a reaction to the Orlando massacre in which the gunman used a semi-automatic weapon to shoot and kill 49 people. "A pretty reprehensible individual would have to be behind doing a promotion that exploits a terrorist event," Hagan said. "When people use weapons to do evil things, it hurts all of us." Hagan says he never once considered stopping the promotion because of the shooting at the Pulse night club. He said now more than ever, his customers are expressing a desire to arm themselves for protection.